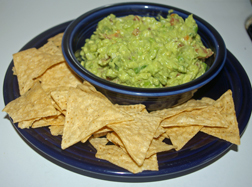 This guacamole is very easy to make and has been a winner every time I’ve served it. It’s also good on sandwiches. The tomatoes are optional, but if you include them you can dice them any size you’d like. I’ve used Roma and cherry tomatoes in this recipe; they’re all good. Mash avocado. Chop garlic. Add garlic, juice, salt and Tabasco to taste. 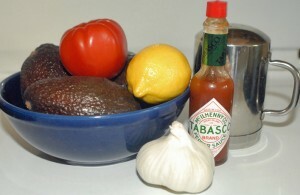 Chop tomato, drain juice and add to avocado mixture.